What made Piel attractive as a harbour was the naturally occurring deep water and the shelter provided by the 10 mile arc of Walney Island. In a government report around the time of the Spanish Armada it was said to be the best harbour between Milford Haven and the Scottish border. There is evidence of Piel being used by the Celts and Romans and thereafter the Vikings. Probably the name Fouldrey came from the Viking word for fodder, the island being a source of food for their cattle. Piel Island was given to the monks of Furness Abbey with the initial grant of land by Stephen, Count of Boulogne in 1127 AD. The monks exerted great influence over the Furness area for the next four centuries, and in 1212 AD they were granted a licence by King John to import one cargo of wheat, flour and provisions to stave off a famine. Twenty years later the Abbey was granted an unlimited licence, so Piel Harbour was officially recognised and – I assume – the Abbot was the first harbour master. In 1258 it was recorded that the Abbey’s own ship came under royal protection, so perhaps they were the first ship owners in the area. In the early 14th century the monks built Piel Castle as a motte and bailey fortified warehouse, and it was only in 1536 with the dissolution of the monasteries by Henry VIII that it fell into disrepair. Piel continued as the main harbour for the area, which was recognised with the provision of a Custom House in 1720 and Walney Lighthouse in 1790. The main trade was exporting the local haematite ore over the years, and in the 18th century it was recorded as having 40 vessels belonging to it. The next significant development came with the arrival of John Abel Smith, a London banker, who bought Roa Island in the early 1840s with the view of developing a Harbour Company, which didn’t materialise due to local opposition by ship operators. Under a Parliamentary Act of 1843, however, he built the causeway and pier. This was quickly followed by the creation of the Furness Railway Company in 1844, which as it turned out was the most significant event in the development of the Port of Barrow and the Furness area generally. They completed a rail track to Roa Island in 1846 as one of the first stages in a network of railways in the area. A ferry service from Piel (Pier on Roa Island) to Fleetwood made a faltering start with the Ayrshire Lassie which kept going aground, and the service was suspended until the following year. The Railway Company found ti very difficult to negotiate acceptable terms with John Smith and it was not a happy relationship. By 1848 however the Furness Railway had the steamer Helvellyn on the Fleetwood service and the Zephyr on the Liverpool service, both sailing out of Piel. A severe storm in December 1852 damaged Piel Pier and the causeway which John Smith could not afford to repair, and the Furness Railway was pleased to buy him out for £15,000. In 1867 the Fleetwood service moved to Barrow with the creation of the first docks. In 1867 the Piel Pier was found to be unsafe for steamship traffic and it was rebuilt by 1868 with an 810 feet long main pier that had a high level with a rail track and a lower level for use at low tide. Each level had a steamer berth. There was also a 300ft long transverse pier that had two steam cranes and a rail track connected to the main line via a turntable, so it was quite a sophisticated structure. Piel Pier continued in use for the Belfast and Isle of Man services run by the Barrow Steam Navigation Company until 1881, when the Ramsden Dock Station was built and the services moved to Barrow. This marked the end of Piel as a commercial undertaking. The Pier was finally dismantled in 1894, although Piel Harbour is still used as a safe anchorage, especially for the dredgers that work maintaining the depths of the approach channels to Barrow. The rich haematite of the Furness area had been mined on a small scale for centuries, but it really started to develop during the Industrial Revolution in the 1700s with the creation of local mining companies such as the Backbarrow Iron Company founded in 1711. They commenced exporting ore from Barrow in 1745. The Newland Company founded in 1747 was exporting ore by 1782 and built the first jetty in the Barrow Channel between Barrow Island and the mainland in 1790. Other jetties followed built by Town and Rawlinson in 1833, Kennedy in 1839, and the famous Henry Schneider in 1842, shortly before the Furness Railway started building their own pier in 1845. Over the following six years the original jetties were dismantled as the Furness pier was extended. The jetties had increased the ship loading rate from about 30-35 tons to 100 tons per day, which was a very significant improvement. It was around this time that the Furness area really started to develop, and a key figure in many of those future developments was James Ramsden who joined Furness Railway on 29th January 1846 as Locomotive Superintendent. He had served an engineering apprenticeship with the famous locomotive builder Bury, Curtis and Kennedy of Liverpool and was 23 when he came to Barrow. He quickly established himself, and over the next 50 years was a significant influence in most of the major developments in the town. The railway commenced freight operations on the 3rd June 1846 and passenger operations the following year, with the Barrow terminus located at Rabbit Hill around what is now St George’s Square. The principal freight for the railways was initially iron ore. Following the building of the Barrow to Pier line the railway extended to Dalton and Kirkby in 1846, then Broughton in 1848 and Ulverston in 1854. In 1863 the Furness Railway took over the Ulverston and Lancaster Railway which had already reached the West Coast main line in 1857, the latter being linked to Barnard Castle in 1861 so that the Durham coalfields were accessible for coal supplies to Barrow. In 1867 the railway was also linked to Sheffield which was an outlet for future steel products. In 1853 the firm of Schneider and Hannay was founded, Schneider having alreadfy purchased the Whitriggs Mine, the royalties of the Mouzell Estate and Park Mine. In 1850 he discovered what turned out to be the most profitable deposits in the area at the Park Mine at what was a last and final test bore. In 1859 Schneider and Hannay opened the Barrow Ironworks, to be followed in 1864 by the Barrow Haematite Steel Company Ltd with Henry Schneider, Lord Frederick Cavendish and James Ramsden as directors. This in turn took over the Ironworks in 1866 to become the Barrow Haematite Iron and Steel Works. Five years later it was the biggest Iron and Steel Works in the world with 16 blast furnaces and 18 Bessemer converters, the Bessemer process having revolutionised steel production since it was developed in 1856. Unfortunately the Bessemer process had lost its commercial advantage by 1890 when new processes were developed for low grade and cheaper ores, which was significant for the local steelworks. Originally James Ramsden had suggested the idea of a steelworks to give the ships taking iron products to South Wales the opportunity to bring back coal and coke for the steelworks rather than coming back in ballast. As it turned out the steelworks exported steel rails all over the world which was also good for the future docks. It was ironic that the creation of the iron and steel industry resulted in it consuming the majority of the locally mined ore, with a decreasing amount being available for export. It was not until 1936 that iron ore imports consistently exceeded the tonnage of local iron ore production. In the 1850s however the export of iron ore had grown to such an extent that the existing quays could not cope with the amount of shipping entering Barrow Channel between Barrow Island and the mainland. The Furness Railway obtained powers under the Furness and Barrow Harbour Act of 1863 to build the Devonshire and Buccleuch Docks with associated facilities, and it repealed two earlier acts of 1845 and 1855 with the Furness Railway taking over their powers, liabilities and property. Under James Ramsden’s guidance the docks were built with Devonshire Dock being opened in 1867 and Buccleuch Dock in 1873, with Ramsden as the first Docks Manager. At the first official opening, Liverpudlian William Gladstone – who was destined to become Liberal Prime Minister the following year – made comment the “someday Barrow would be a Liverpool”, rather an optimistic comment given Barrow’s geographical remoteness I think. Initially timber imports from Canada were encouraging, with Potter Walker establishing a yard at Barrow. Steel rails, iron ore and pig iron were shipped out, but the grand Furness Railway warehouse and bonded store was under utilised. In 1871 the Anchor Line started a Barrow – Glasgow service with 3 ships. In 1870, at James Ramsden’s instigation. he and the Duke of Devonshire founded the Barrow Flax and Jute Company to provide employment for women and young girls, and the factory opened in 1874. Jute was imported from Calcutta via the newly opened Suez Canal, using the Eastern Steamship Company’s ships. These ships had been built by the Barrow Shipbuilding Company which had been set up in 1872 by the Furness Railway directors, which turned out to be one of their most successful ventures. The Eastern Steamship Company and the Barrow Steamship Company were both subsidiary companies of the new shipyard. Barrow Steam Cornmill was established in 1871 next to the Furness Warehouse, with James Ramsden a director. Later it was to become Walmsley and Smith in 1880, and in 1903 was purchased by Hutchinson, a Liverpool miller. With the completion of the Buccleuch Dock in 1872, Ramsden continued with his plans for extending the docks with the creation of the Ramsden Dock and Cavendish Dock. The work proceeded slowly and it was until 1879 that it was completed. Cattle sheds were built on the south side of the entrance for the Merchant Trading Company who imported cattle from America. The Ramsden Dock was connected to the rail network via a swing bridge across the Buccleuch Passage completed in 1879, and Ramsden Dock Station was opened in 1881. Between 1877 and 1883 Piel Bar was dredged to 9 feet below LW spring tide, and the channel to Piel widened to 100ft. The passage between the Devonshire and Buccleuch Docks was widened from 40ft to 80ft in 1878 and a high level opening bridge built across it which was opened in 1882. The Belfast Berth was dredged out in 1884/5. The final 25 years or so of the 19th century were unfortunately plagued by intermittent recessions in the Furness area, which made it necessary for some of the new Furness Railway enterprises to seek financial intervention from time to time, and the Duke of Devonshire showed great social responsibility in this respect. The jute works suffered the setback of severe fires in 1879 and 1892, and following the latter the damaged areas were not rebuilt. It was sold in 1897 and finally closed after the First World War. On the brighter side the independent Barrow Chemical Wood Pulp Company had a factory built at Salthouse that opened in 1890 and became Killner Partington Pulp Company in 1892. In 1919 to became Barrow Paper Mills Ltd producing fine paper for the printing industry, and its import of paper pulp was an important traffic for the port for very many years up to 1972. Oil importation commenced in 1888, and the following year oil storage tanks had been built on the Barrow Island side of Ramsden Dock. At the turn of the century several oil companies were using the port including Producers Petroleum Company, Anglo-American Oil and the Asiatic Petroleum Company. James Ramsden resigned as Managing Director of the Furness Railway in 1895 and this marked the end of a great industrial era in Furness. He had – and I quote – turned a rural corner of England into a roaring, smoky, industrial centre, but the geographical remoteness prevented the realisation of Ramsden’s vision of Barrow being a Liverpool, Sheffield and Birmingham rolled into one. Alfred Aslett, a very experienced and successful railway operator was appointed to the new post of general manager. His expertise was very much in promoting passenger traffic and reducing costs. The Barrow-Fleetwood service, which had ceased in 1870, was restarted due to the popularity of Blackpool as a holiday resort by this time. The Furness Railway purchased the paddle steamer Lady Evelyn which arrived in Barrow in 1900 to start the service to Fleetwood. The Lady Margaret was added in 1903 and replaced by the Philomel in 1908, which in turn was replaced by the Gwalia in 1910 which became the Lady Moyra. By the end of 1912 Aslett had increased passenger bookings on the Furness Railway by 53% and passenger revenue by 44%, which was crucial given the decline in freight traffic. There were problems on the horizon however as the Midland Railway had obtained powers to build a rail link to Heysham in 1892, and then in 1895 deposited a bill in Parliament for a harbour at Heysham which was built by 1904 with a Heysham to Belfast ferry service starting on 1st September 1904. This had a catastrophic effect on the Barrow route. It was agreed that the Midland Coimpany would buy the Barrow Steam Navigation Company and operate a thrice weekly service from Barrow to Belfast. The summer season of Isle of Man sailings were to be discontinued at the end of 1907. The start of the First World War then saw the requisition by the Admiralty of the Barrow to Belfast steamers City of Belfast and Duchess of Devonshire, which was the end of the service. With the sale in 1897 of the shipyard to Vickers Sons and Maxim Ltd – Vickers of Sheffield and Maxim of London, gun manufacturers – the shipyard commenced a campaign to dominate UK warship production. Vickers wrote to Furness Railway on 8th February 1899 expressing concern over the draft restrictions on the Ramsden Dock lock, and the Railway Company agreed to lower it, sharing the expense with the shipyard. Subsidence during the works delayed completion which caused considerable concern to the shipyard as it delayed delivery of HMS Vengeance and prejudiced future orders. The shipyard also required the Buccleuch Dock passage to be widened from 80ft to 100ft which was completed on 12th October 1908, with construction of a new bascule bridge over the passage. These costs added to the financial burden of the Furness Railway Company and in 190 they considered, with Barrow Corporation, the possibility of a jointly owned Barrow Docks and Harbour Trust, but this dropped by the Furness Railway Board. In 1911 following agreement with the shipyard the Walney Channel was widened to 300ft and dredged to agreed depths, with a deep water berth constructed in the Walney Channel. In 1916 Ramsden Dock entrance was lowered at No.1 cill, and the lifting and rolling bridge between Devonshire Dock and its basin replaced by a caisson. During the First World War the shipyard, the steel mill and hence Furness Railway and the docks were busily engaged in the war effort under government control until August 1921. In 1922 Furness Railway made an attempt to rejuvenate the regular Barrow-Fleetwood steamer service with the chartered steamer Robina, but it made a loss and was never resumed although there were occasional cruises and excursions. This was almost the last throw of the dice for the Furness Railway as they were taken over by the LMS with effect from 1st January 1923. Between the wars the port imported iron ore, grain, metals, petroleum products, timber, paper pulp and general merchandise. Exports included machinery, manufactured cast iron and steel products, pig iron, steel rails, pitch and general cargo. In 1929 the oil storage tanks alongside Ramsden Dock became disused apart from requisition by the government for strategic oil reserves during World War Two. During World War Two the port was again busy in the war effort as were its customers, but afterwards there was a slow period of decline. On 1st January 1948 the railways were nationalised and came under the control of the British Transport Commission until 1st January 1963 when the British Transport Docks Board took over the railway ports apart from the packet ports. In 1967 the rail bridge across the Buccleuch Passage was taken out of service and removed about five years later. This was the start of a series of reductions in the rail network around the dock system. There were also a significant number of factory closures which included the Ironworks on 31st March 1963, the Corn Mill in the 1960s, Barrow Paper Mills Ltd in 1972, the Steelworks in 1983, Trade was so bad that by the end of 1974, after two years of discussions with local interests, the port virtually closed to commercial shipping and all the cargo facilities were removed. The one good sign, however, was Bowater-Scotts decision to build a factory on Park Road in 1967/68, but they imported their paper pulp in bulk carriers too big for Barrow at that time. The port was kept open for the purposes of the shipyard and the BNFL traffic which had been handled at the shipyard quay since 1966. Barrow has a great record of survival however and within a few years the situation changed fairly rapidly. 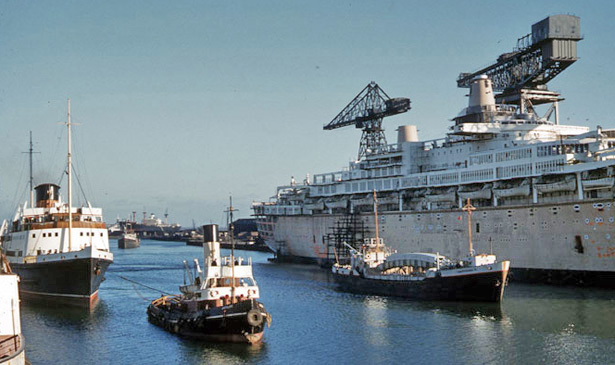 BNFL made a temporary move to the north side of the Buccleuch Dock from 1979 to 1982 when their purpose built facility – Ramsden Dock Terminal – came into operation with a heavy lifting crane and a dedicated rail connection. The shipyard, which had become part of British Shipbuilders in 1977, completely renewed their main shipbuilding facility between 1982 and 1988 in preparation for the Trident submarine built project. The west end of Devonshire Dock and the original entrance were filled in with material from Roosecote Sands, and the Devonshire Dock Hall and ship lift together with the new quays were built on the reclaimed area as the first stage of the modernisation process. In the middle of the modernisation of the shipyard Vickers was privatised with a management buy-out in 1986, the Docks Board having already been privatised with effect from 31st December 1982 when it became Associated British Ports with financial freedom from the government. All the work had to be completed by 31st December 1991 for the first sea trials of HMS Vanguard. We also had to dredge out the fairways in the Ramsden Dock Basin, Buccleuch Dock and Devonshire Dock, create a turning circle in the Ramsden Dock and a deep dive hole in the Devonshire Dock together with stopover facilities in the Ramsden Dock Basin. ABP also built a new warehouse on the south side of the Anchor Line Basin for lease to VSEL for the storage of pipework for the Trident submarines and this was completed in 1989. When VSEL no longer required this facility in 1995 it was used by Robert McBride for storage of soap powder. In order to manoeuvre the submarines safely through the docks and out to sea it was necessary to provide guidance bogies for the Devonshire Dock passage and the Ramsden Dock lock, as well as a tide gauge monitoring system for the channel out to Lightning Knoll. We were also asked to provide a dock impounding system so the water level in the dock could be brought up to specific levels. Altogether with the DDH these works were by far the biggest civil engineering project in the docks since the building of the Ramsden Dock and Anchor Line Basin in the 1870s, and it was very satisfying for all concerned to complete them within costs and programme so that they were easily ready for the sailing of HMS Vanguard on sea trials in October 1992. With the development of the Morecambe Bay gas fields in the early 1980s, and the construction of the South Morecambe Onshore Terminal, British Gas needed a storage facility for the gas condensate which has to be extracted from the gas before it is pumped into the grid. The disused oil storage facility alongside the Ramsden Dock was an ideal location for this, together with adequate waterside frontage for building a loading berth, and these were to be leased from ABP. The first condensate was shipped in 1986 for use in the solvent industry, with five tanks having been completely refurbished. In the 1990s when British Gas developed the North Morecambe field and built a further onshore terminal they refurbished the remaining sixth tank at the storage depot. In 1983 Tilcon started shipping out high quality limestone from Stainton Quarry to Odds in Norway where it was used in gas production, and now it is shipped to Norrkoping in Sweden where it is used in paper making. In September 2006 Bardon commenced shipping out granite chipping from Gill Scour Quarry near Millom to South East England to be used for road dressing. In May 2006 it was very pleasing to see Kimberley-Clark commence regular imports of paper pulp for their Barrow factory after a successful trial in 2005. This will take a significant number of road vehicles off the A590 as well as being a boost for the port – when we look back to the period before 1972 when the wood pulp business had been the port’s main traffic. In addition to the more regular traffics the port has also handled some big offshore contracts and project cargoes over the past 20 years or so. There have been some very successful pipeline operations for British Gas and other offshore operators. The port has also handled some of the biggest loads to be moved on British roads when British Gas built their North Morecambe Onshore Gas Terminal in modular form. Roosecote Power Station brought their main turbines in through the port, and they draw cooling water from Cavendish Dock. The shipyard also moves colossal loads around Barrow Island when they move ship sections from one area of the yard to another. The offshore wind energy operators have used the port as a base, which is ideally placed for the Irish Sea operations with large areas of storage land. The customer who has the longest record of Using the port is James Fisher and Sons PLC, the local ship owner and shipping agent established in 1847. As well as being ship owners, in their time they have also been ship builders in Barrow, and it is very pleasing to see them going from strength to strength. In 1996 the company bought the 21 vessels of P & O Tankships, and in 1997/8 they purchased Everards, the long established coastal shipping company who were operating 11 ships.